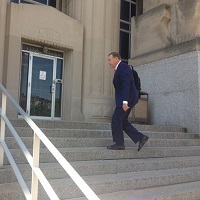 (St. Louis, MO) A St. Louis judge on Monday decided on several motions crucial to Governor Eric Greitens’ felony invasion of privacy case. Two of the most significant rulings by Judge Rex Burlison was not to dismiss the case and to allow the alleged victim to testify. The defense had argued the woman’s testimony has been tainted by the former lead investigator, William Don Tisaby, hired by the prosecution. The defense has accused Tisaby of repeatedly lying and withholding evidence. Defense attorney Jim Martin said Tisaby has “molded” the testimony of the woman involved in the affair with the Governor. “They moved her to statements that made her more and more like the victim,” Martin argued. Burlison agreed with the prosecution’s argument that it should be up to a jury to decide whether the woman is credible. During the hearing, Burlison also asked the prosecution if they had obtained the photo. Chief Trial Assistant Robert Dierker answered no and said the case rests on circumstantial evidence. The defense had also renewed its request for a bench trial, citing that the Governor could not get a fair trial with all of the pre-trial publicity. Burlison said he would reconsider during jury selection if it becomes apparent that an impartial jury cannot be selected. Jury selection is set to begin on Thursday. Greitens is accused of taking a compromising photo of his former mistress and threatening to back mail her if she ever revealed the affair. Greitens has admitted to the extramarital affair but has denied the allegations. His trial is scheduled for May 14th.